Mary Howard did not get that memo. She defied convention and traveled with the Red Cross to the Pacific during the war, not only as a patriot and an adventurer, but also as a keen observer. Her extensive journal later became a book recounting her observations and experiences. The original manuscript is maintained at East Carolina University in a collection at Joyner Library to honor her role as an important voice for women, as an alumna and also as a philanthropist. Howard never married, devoting her life to education. She taught for many years in Edgecombe County public schools. She was an avid gardener and known for her keen sense of humor. 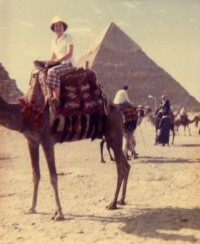 The adventures continued, with travels taking her throughout the world and even to Egypt when the pyramids were first being explored. Howard was also generous. Charitable giving during her lifetime was typically anonymous and centered on educational causes at ECU and Edgecombe Community College. That her generosity continued after her death was no surprise to those who knew her, but the extent of her largesse was remarkable. Her bequest of $2 million to establish an endowment at the NCCF funds several causes, including scholarships and a significant gift to the Edgecombe County Community Foundation’s unrestricted fund to support scores of important nonprofit programs in her native Tarboro area. So generosity is being passed down as a family legacy, and one that Mary Ferebee Howard would be proud of today.